This product includes a foldable with suggested notes, worksheet, and answer key covering Association – 8.SP.A.2. In my class, I use the left hand side of the notebook for guided notes with foldables, while the right-hand side is reserved for individual practice work. There is a one-sided worksheet to be glued into interactive notebooks on the right hand page opposite the notes. I usually trim just a bit around the edge of the worksheets with a paper cutter so that they fit perfectly, but this is not necessary. 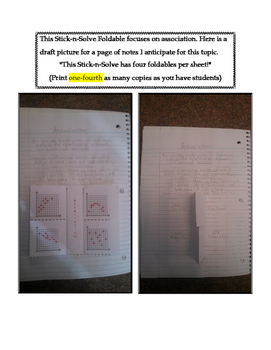 I started using Stick-n-Solve Foldables in my Math Interactive Notebooks last year and it worked great! There are a few things about these Stick-n-Solves that I really have enjoyed. First, my students no longer spend time copying down problems when we take notes. I always thought this was a waste of time. Now, the problems are on the foldable ready to be solved. The students like to cut and fold and glue while working in their notebooks. It gives them something tactile to do during class. Finally, the foldables are a built in review tool for your students. At the end of a unit, they can go back through their notebooks and solve all the problems on the Stick-n-Solves. Since the work is on the inside, they just open them up to check their answers. Each foldable in this set has two per page. My students are set up in partners, so I give one sheet to each partner pair to cut in half. There is no extra paper on these foldable templates (which means no little scraps of paper to trim off and end up all over the floor). With the foldable, you will see two pictures. You will see a draft picture of notes for the topic, and a picture of the solutions on the inside of the foldable. These activities can be found in many different bundles, including my ENTIRE 8th Grade Math Curriculum! Check out my store for all of your options! 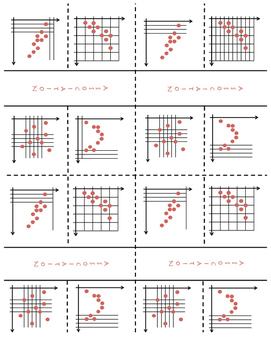 Know that straight lines are widely used to model relationships between two quantitative variables. 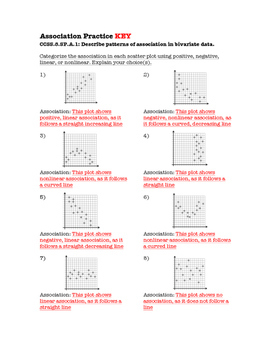 For scatter plots that suggest a linear association, informally fit a straight line, and informally assess the model fit by judging the closeness of the data points to the line. 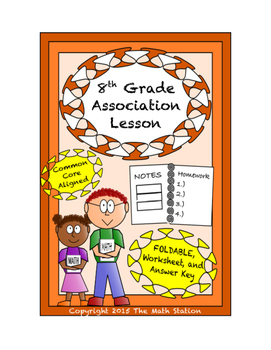 8th Grade Association Lesson: FOLDABLE & Homework by Kimberly Wasylyk is licensed under a Creative Commons Attribution-NonCommercial-NoDerivatives 4.0 International License.